The Challenge this week with Whimsy is Monochromatic. It was a great blessing to be able to sneak of to my scrapbook room in my basement this week to create. The cool of my sanctuary was very welcome with the temperature outside hitting like 33 degrees Celsius that is 91.4 in Fahrenheit. It is a bit warm, but I am not complaining I'm glad we are getting a beautiful summer. Our summers are too short as it is, so I welcome the warm beautiful summer days when we get them. My last monochromatic card I did I used the color of brown. That would have been an awesome color to used for this image but, I always try to step out of the box and try something new and different to challenge my self. So I thought I haven't tried blue before lets go with that color, I colored my base color then started shading and I really didn't like the color. It was really weird for me to color it. So I stopped coloring and went to the computer to print a different image and this same one with the intentions of coloring it brown - or just to color a different image. As I sat down to color, I kept looking at that same image again, No I was going to make this image look great using the blues of my copic colors. Well, I really like the way it turned out. I guess walking away from it and going back or just being persistent has paid of. 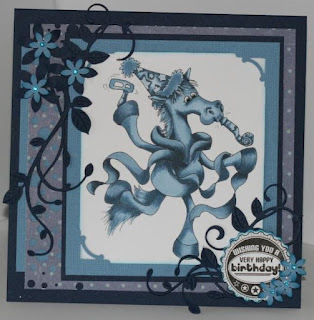 I really like my blue image called Party Animal from Whimsy Stamps. You can click here to check out the Other Whimsy design team cards for this challenge - Monochromatic. Hope to see your card on the Whimsy Challenge blog for a chance to win some really wonderful digital images of your choice. 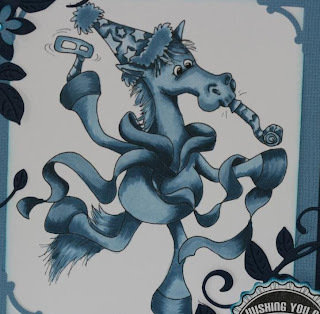 If you decide not to enter I hope that you have at least been inspired to try something different and do a monochromatic card. 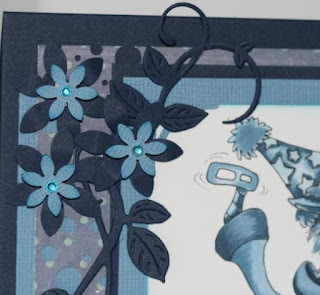 You don't have to color an image just use the same hues of a color to make your card. Have fun with it, you never know where it might lead you. 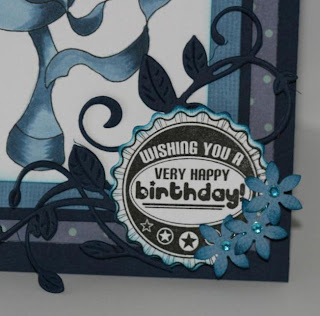 This little piece in the corner of my card was made using; Whimsy Bottle Cap Die, Vines Die Set and Rubber stamp set Retro Bottle Cap Sentiments. 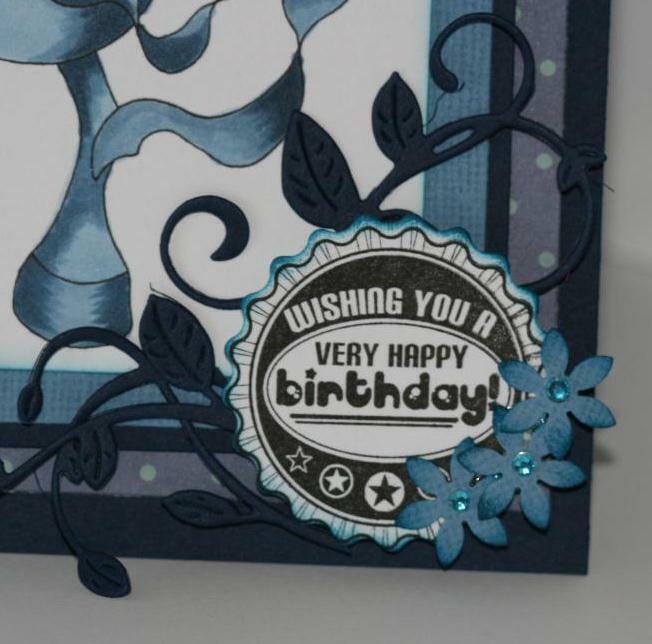 As well as a couple EK flower punches with a gem in the middle. This is the top left corner of my card made using Whimsy Stamps Vines Die set, a couple of Ek flower punches and Gems. Damn friend that is nice, and I like how you explained the Monochromatic description...makes it very clear. I like this image, great coloring, and I hope many people make a Monochromatic card, because they are wonderful, and you made this one amazing! WTG!